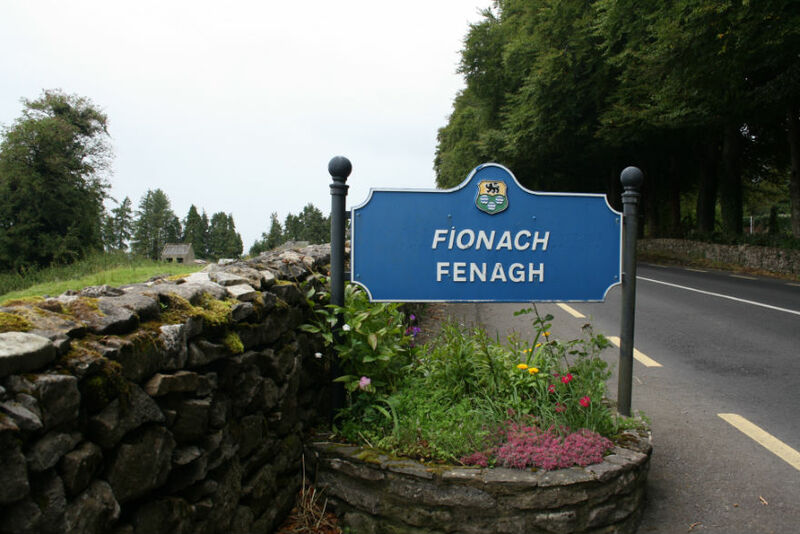 A ‘Book of Fenagh 500 Festival’ takes place in the village of Fenagh, County Leitrim, on 29–31 July 2016. The events commemorate the making of a medieval manuscript known as the Book of Fenagh or Leabhar Chaillín, now among the treasures of the Royal Irish Academy in Dublin. The Book of Fenagh tells the story of the life of St Caillín, founder of an early Christian monastic community at Fenagh. Caillín is said to have been a disciple of St Columba. Tadhg Ó Rodaighe (Roddy/O’Roddy/Rodachan) of Fenagh commissioned the manuscript in the year 1516. He had a political motive. Ó Rodaighe wished to use stories about St Caillín and the saint’s association with Fenagh to support his own local ambitions, and to promote the status of Fenagh. The life of St Caillín that the manuscript contains was based on an older verse compilation that no longer survives. The new 1516 manuscript had both prose and verse. The manuscript was written in the Irish language by a talented scribe, Muirgheas Ó Maoilchonaire of Cluain Plocáin, in County Roscommon. It is written on vellum (calf-skin), and is a very fine example of late medieval Irish manuscript production. 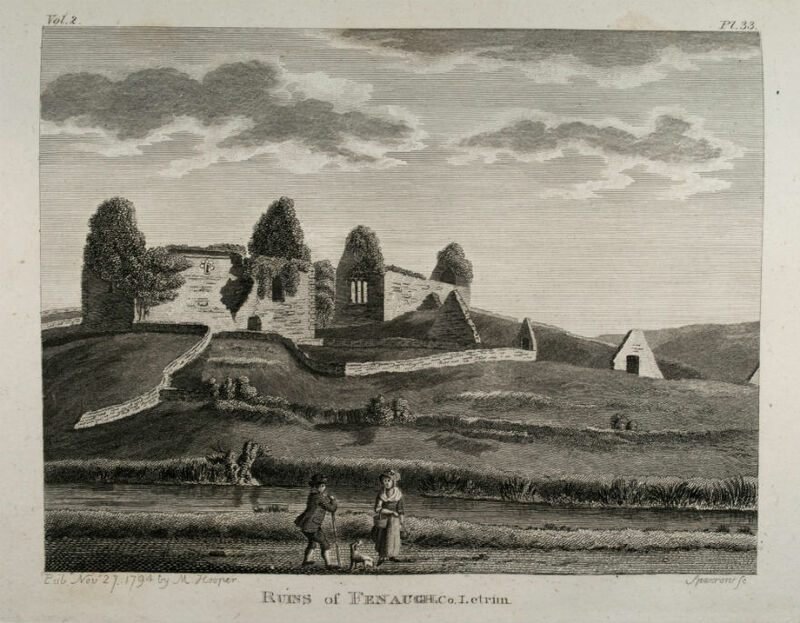 Following the Reformation, the church lands at Fenagh were transferred to the protestant bishop of Ardagh in 1585. Part of the former monastic church was used for worship by the Church of Ireland until a new church, St Catherine’s, was built nearby c. 1800. 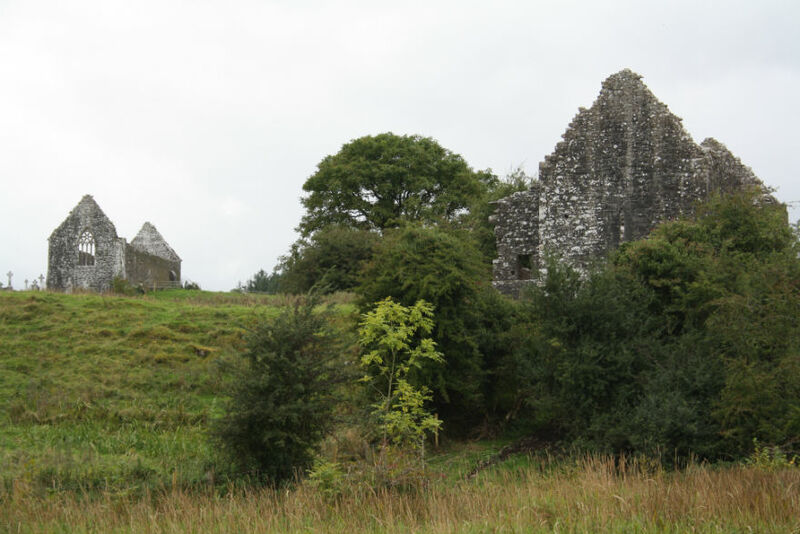 Before the end of the eighteenth century the two medieval church buildings at Fenagh were mere picturesque ruins. The larger medieval church on the site, rebuilt in the fifteenth century, still retains ornate tracery in a large east window. The smaller medieval church to the north-east was the parish church, and the original patron of the Book of Fenagh was erenagh of the parish church. Was the manuscript perhaps originally kept on the upper level of this building, accessed by the stone stairs that still survives at the west end? The manuscript remained in Fenagh for over 300 years and was still in the possession of the Ó Rodaighe family in the early nineteenth century. 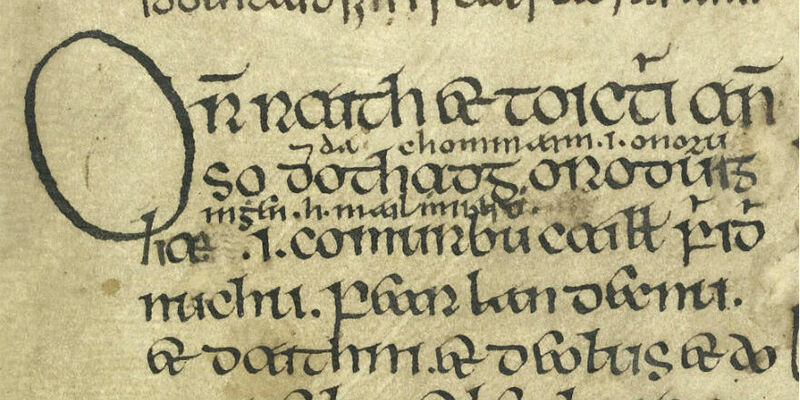 After the death of the last Ó Rodaighe owner, the Book of Fenagh was given to Bishop Conroy of Ardagh for safekeeping. In 1888 his successor, Bishop Woodlock, sold the manuscript to the Royal Irish Academy for the sum of £10. This was done on the advice of Rev. Denis Murphy, S.J., ‘in order to ensure its safety for all time’. The enthusiasm of Denis Kelly, a Roscommon landowner and bibliophile, ensured that the manuscript was translated by 1857. William Hennessy, who worked in the Public Record Office of Ireland, prepared the original text and notes for publication, and their work was published in 1875. 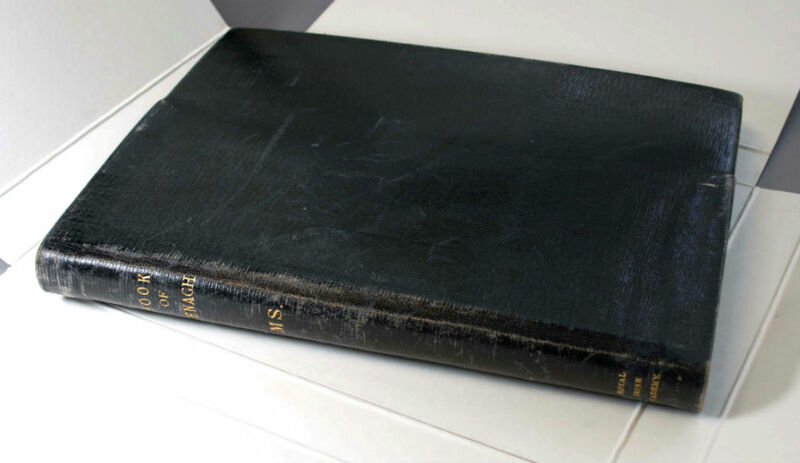 The manuscript was bound by the Royal Irish Academy and was catalogued and given the shelf-mark 23 P 26. The manuscript was digitised by the Irish Script on Screen project in 2003, and it can now be viewed online. 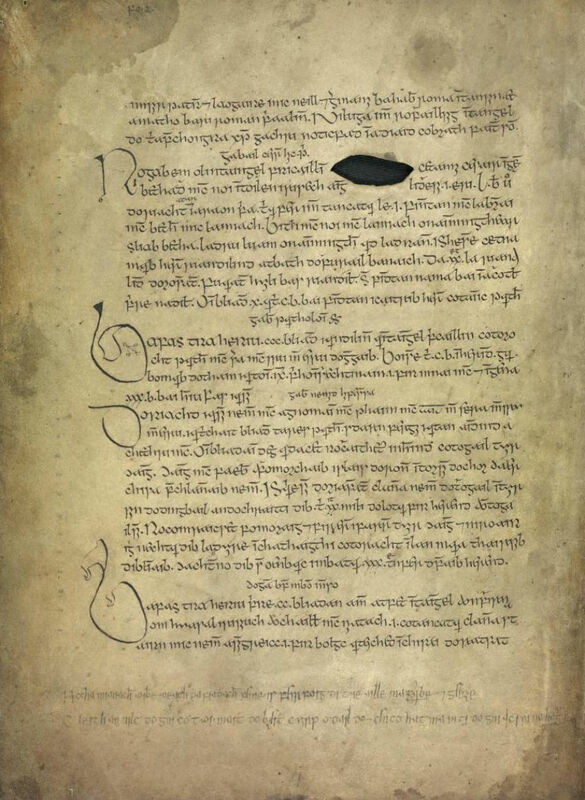 A particular highlight of the ‘Book of Fenagh 500’ festival will be the newly commissioned facsimile of selected pages from the Book of Fenagh that will be on display in Fenagh. The new vellum manuscript is the work of Timothy O’Neill, one of Ireland’s most accomplished scribes. Through him, the skills and techniques of Ireland’s medieval scribes are being carried on into the twenty-first century. A book of historical essays, Making the Book of Fenagh, is being published by Cumann Seanchais Bhreifne in 2016, edited by Brendan Scott, Raymond Gillespie and Salvador Ryan. In late summer and autumn 2016, the Library of the Royal Irish Academy will have a special exhibition and lecture series in Academy House, the centre-piece of which will be the 500-year-old Book of Fenagh. Listen to Noel McGuinness interview Bernadette Cunningham about the Library and the Book of Fenagh - recorded at Academy House during Culture Night 2016. M. J. Moore, Archaeological inventory of County Leitrim (Dublin, 2003), #1410. M. Herbert, ‘Medieval collections of ecclesiastical and devotional materials: Leabhar Breac, Liber Flavus Fergusiorum and The Book of Fenagh’, in B. Cunningham & S. Fitzpatrick (eds), Treasures of the Royal Irish Academy (Dublin, 2009), pp 33–44. B. Cunningham & R. Gillespie, ‘Muirgheas Ó Maoilchonaire of Cluain Plocáin: an early sixteenth-century scribe at work’, Studia Hibernica, 35 (2008-9), pp 17–43. M. J. Moore, Archaeological inventory of County Leitrim (Dublin, 2003), pp 175-7. Ardagh Diocesan Archives, Letter from D. Murphy to B. Woodlock, 11 January 1886. As part of the current RIA lunchtime series ‘Sisters’, Dr Lucy Collins delivered her lecture '"Who will ever say again that poetry does not pay? ": The Yeats Sisters and the Cuala Press ' at Academy House.